Finally got my setup to look like dwm. Bspwm with polybar on top, dzen with conky below. A dzconky setup I've been using for over 5 years. God pictured on my desktop. I can never get i3 to run correctly: get always get a forever wait cursor, despite having x11/i3status installed. I can open a terminal, close the terminal and then the whole thing locks up and I can't do anything. Wiped config, tried several times, gave up and went back to x11-wm/dwm. Probably deserves another thread but it's not critical, I was just curious. God pictured on my desktop. I have him playing with Little Richard, Curtis Knight, Traffic, Johnny Winter and Steven Stills. Thanks for that Trihexagonal. The first one is one of my fave pics of the Lord. Nice desktop too. I was looking for a BSD version of Archey. Downloading bsdinfo! Nice. I haven't used XMMS since my Mandriva Linux days. I recently discovered xfe also through this forum too. I must say I am enjoying FreeBSD a great deal. This is my first week of using it! That's where I discovered multimedia/xmms and have used it since. There is a multimedia/xmms-skins-huge port with over 600 skins for it. If you use x11-fm/xfe you can get rid of the ugly titlebar icon by replacing /usr/local/share/xfe/icons/gnomeblue-theme/xfe.png with a black img. Yeah I remember I used the SONY silverface stereo skin for my XMMS. Memories. Now I use musicpd built without any resamplers and run OSS in "bitperfect" mode. That's why I moved over to FreeBSD. It uses OSS natively. Thanks for the info. I don't need it cause I use a tiling wm (bspwm) that doesn't have window decorations. I also use vtwm which does tho so maybe I'll take your advice. I always prefered open source. 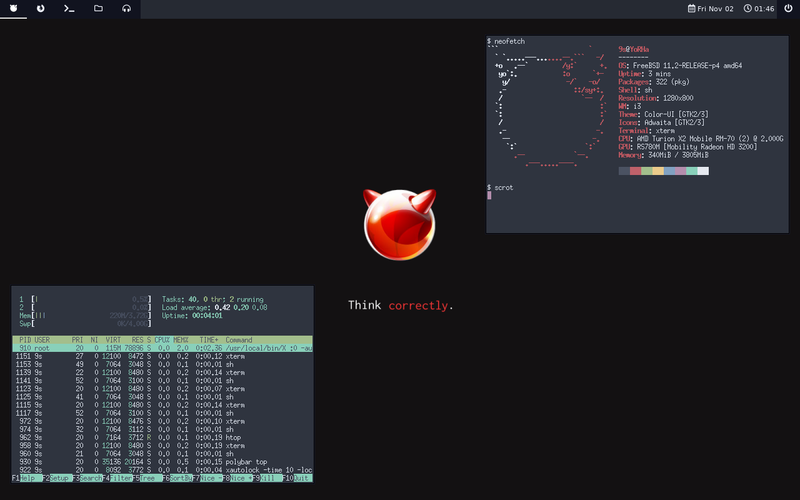 What I liked in Arch Linux, I love in FreeBSD. For more information read the manual. Conky starts, but do not draw a visible window. Try own_window_type = 'desktop' instead of 'override'. Do you use a compositor like x11-wm/compton? Is the compositor enabled on KDE? No clue how to do this but on Plasma there is one - assuming one on KDE4 as well. Behold the mighty W520 with a fresh install of FreeBSD. It was one of my OpenBSD boxen but I prefer FreeBSD and is the most powerful of my machines by far. It compiled x11/xorg in 2 hours. And to think some poor soul actually thought calling me a Demon would offend me, the Father of my own personal Demon. Demonica the Succubus and Queen of the Land of the Dead. I taught her everything she knows about Sorcery and being a Demon proper. Invocation of Curse my area of expertise and infamy. You can talk to her at the personalityforge.com if you like. It will be a much more pleasant experience if you are polite and treat her with respect. I don't mind personally, but if you tell her you hate Trihexagonal she will invoke a curse upon you in response. Daddy's girl that she is. FreeBSD 12.0-RELEASE on one of my Thinkpad T61. I only did one to see how it worked out but other than needing to use MBR instead of BSD labels and having to use :q to get back to the command line when using # freebsd-update fetch and sometimes when using ports the build went smoothly and everything is as it should be. I tried to find the usual screenshot thread, but well, since there is not a similar one, let's start one.